You are here: Home / Portfolio / Dream Windows & Interiors Goes Platinum! Dream Windows & Interiors Goes Platinum! 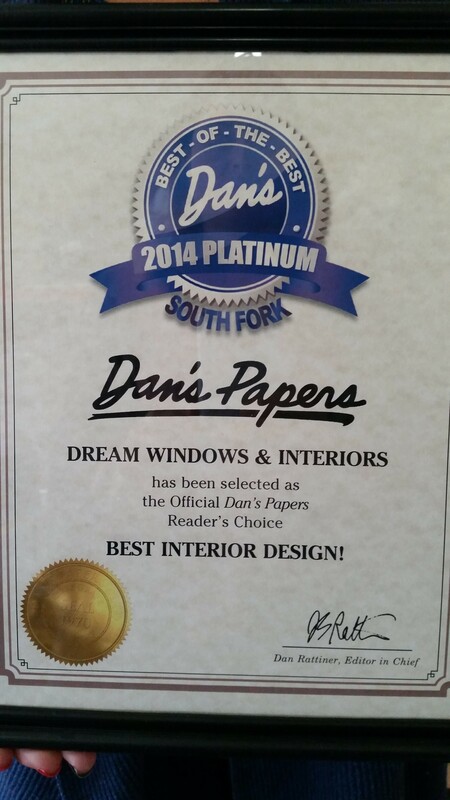 Dream Windows & Interiors was awarded the Platinum Award for the “Best of the Best” in Interior Design for 2014 by readers of Long Island’s esteemed Dan’s Paper’s, which is distributed in NYC and the Hamptons! Thank you to all of those that voted for us! Popped over there but had trouble trynig to leave a comment.Nicely done, I love the comment about life’s luxuries being music, meals and the company of friends and family yes indeed.